It seems to be a growing trend now that when Google release a new O/S version, people who paid a lot of money for a device on often a 24 month contract are being shafted by their OEM who initially said that an update would be supported. 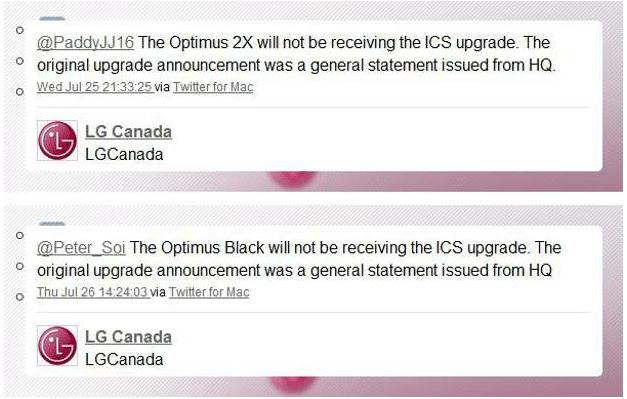 The highly popular Optimus 2X and less popular Optimus Black were both promised an update to Android 4.0 when Google announced the update however just months down the line, the struggling handset manufacturer has come out and said that both devices will not see the update and that the initial statement was simply a “general statement issued from HQ". What’s your thoughts on this then? HTC, Sony and now LG – who will be next to backtrack? Panic averted. Apparently the update isn’t coming to Canada. The Korean offices are still working on an update. Last LG I every buy, in any case. I can understand that they would rather not provide support for their phones, or get you up to the latest OS which might delay you purchasing a new phone, but that practice in the end is just going to drive people to other manufacturers. I can totally get it if the hardware won’t support the new OS to some defined level of performance, but that is not the case with the G2x at all.